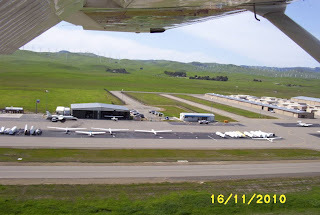 Last Sunday I participated in the Group 2 Livermore SAREX at the Livermore Airport (LVK). This was a two day weekend event where many of the participants such as I are trainees. I participated on Sunday as a Mission Pilot trainee preparing for my Form 91 check out. The Form 91 is an oral and practical exam given by a CAP Mission Pilot check pilot prior to earning the Mission Pilot rating. See the Presidents Day blog postings for more information about the Mission Pilot training. We were short one aircraft on Sunday, so my task was to drive up to Gnoss Field Airport (DVO) and fly Squadron 23's Cessna-206, callsign CAP 450 down to LVK, fly the sorties and then return to DVO. There were several sorties scheduled for the Sunday and the deteriorating weather was becoming a factor. Rain was forecasted for 2:00 PM and I wanted to be airborne back to DVO no later than 1:00 PM. The preflight and weather briefing took a little longer than expected and I was wheels up by 8:30. 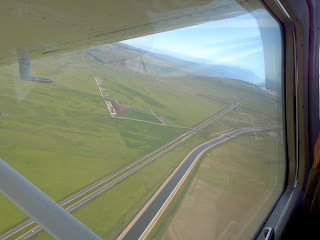 My 20 minute flight from DVO to LVK was a short flight eastward along the shore of San Pablo Bay followed by a turn southward through the San Ramon Valley and on towards the Livermore airport. After landing I quickly secured CAP 450 and hustled into the terminal building and checked in. The crew briefings were underway and soon found out my crew assignment and search scenario. My squadron commander was going to be my Mentor Pilot, and 1st Lt Dave Montgomery and Paul Barrett were going to be the Mission Scanners. The mission for my SAREX scenario was to search in grid SFO 210D (Discovery Bay) for a Cessna 150 which had not arrived at his destination after a flight from San Carlos to Sacramento Executive. We performed the necessary preflight procedures such as direction of flight; identify any hazards to flight, risk assessments and the weight and balance. Believe it or not the preflight procedures easily take an hour and sometimes longer. This time it took longer, but we were wheels up shortly before noon. The skies were overcast and there was light rain as we crossed over the hills north-eastward into the central valley. The central valley is a great place to practice, the terrain is flat and level, and the roads run in a north/south and east/west direction. This makes it easy for the pilot to identify key roads and use them as landmarks and boundaries. We first flew our search grid at 2000 feet to identify the corners, and then I descended to 1000 feet and flew a parallel search (think rows) from west to east. After our search grid, we headed direct to Byron Airport and landed. We had been directed to land there by the Incident Commander and to not check in with base as required. The purpose of this was to test the base staff trainees and see if they would notice that CAP450 had failed to check in and was missing. Aircrews are required to check in (OPS Normal) at the top and bottom of the hour, we did neither. I am happy to report we weren't on the ground 10 minutes before our cell phones were ringing. I answered my cell phone and the person on the other end was none too happy with us. He wasn’t rude but he was perturbed. I quickly passed the phone to my Commander and let him deal with it. In my eyes the base staff trainees passed the test. We were then ordered to return to base and off we went. The debriefing for our sortie by the Air Operations Branch Director went well. We didn’t find the the missing Cessna 150 but we did provide information about the deteriorating weather, visibility and search conditions. Our INTEL was useful because the Incident Commander was able to discern that a second sortie was not going to be an option. The weather over DVO also precluded me from returning CAP 450 to DVO, rats! This meant I needed to arrange a ride with my good buddies to drive me the 65 miles in the rain from LVK to DVO. Fortunately this was not a problem and the CO Capt Jeff Ironfield and the XO Capt Noel Luneau, graciously offered me the ride. All in all, I found the Livermore SAREX to be very well organized, the LVK staff friendly, and the facilities were perfect.